Le Fleuron is located next to Lavau’s characteristic “courtyard” and is splendidly light, spacious (ca. 60 m²) and luxurious. Le Fleuron is a delightfully airy and comfortable cottage for 2 to 4 persons.The cottage was constructed in 2013 in the old stable block. This new cottage meets all the requirements of modern living but still has many period features. A short tour of the cottage: ; You enter into the living room finding on your left a complete kitchen with dishwasher, fridge/freezer combo, oven, ceramic plate with extractor hood, microwave oven, electric kettle, coffee machine and enough pots and pans, kitchen gear, tableware, glassware and cutlery. The living quarters offer a nice snug dining and sitting area with a comfortable sofa bed measuring 1.6 x 2 m (5’4” x 6’8”). Two chairs, a TV with DVD player and HIFI set with CD player. The hall of the living room has three doors. One gives access to a spacious bedroom with a double bed measuring 1.6 x 2 m (5’4”x 6’x 8”). 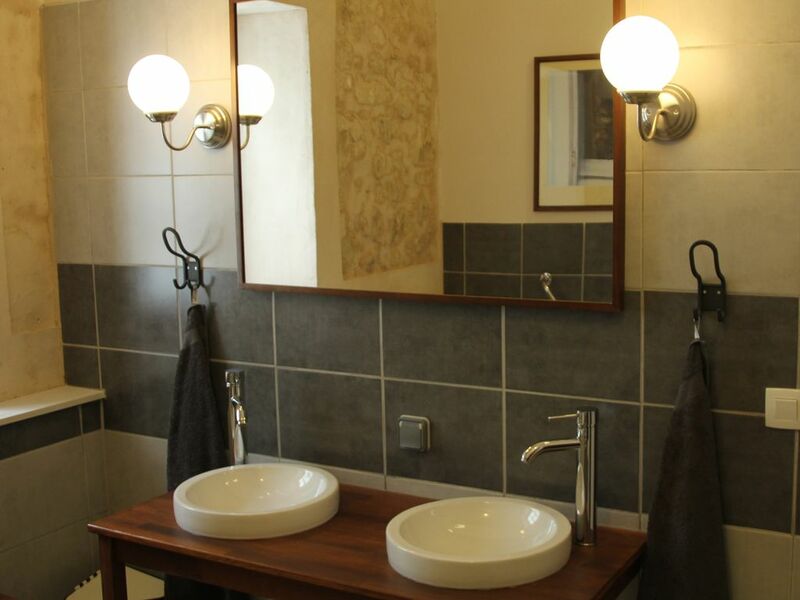 The second leads to the separate toilet and the last opens to a comfortable bathroom with walk-in shower of 0.9 x 1. 2 m (3’ x 4’) and a bathroom cabinet with double wash basin and a bath.